Last year, of all the posts I did around the holidays, I think my very favorite was the gift guide for book lovers. 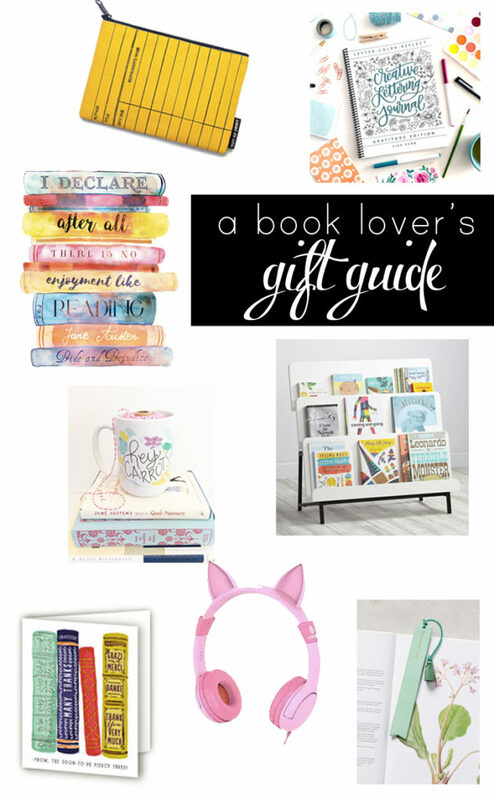 I mean, what could be more fun than hunting down the coolest (or nerdiest, take your pick) gifts for bookworms?I’ve been waiting all year to do this again, and I’m in love with all 14 items here. I’ll take one or five of each. And with these gifts you can acknowledge their book-loving ways without worrying that they’ve already read it or that they’ll think you have the worst literary taste in history. Leather Idiom Bookmarks – I never used to use bookmarks, but now I hate to read without one (apparently now my time is so precious that I hate to waste a bunch of time trying to find my spot again). These leather ones are so pretty, stamped with fun little phrases in gold lettering, and super affordable. Hey Carrots Mug – I was always like, “what’s the deal with mugs?” and now I love having a mug that I know is mine so I’m not plowing through six identical water glasses every day. And this Anne of Green Gables one is just too cute. I’m obsessed with the literary heroine prints in this shop. New Issue Bookcase – We are so far away from thinking about the basement in our house, but when we do, I already know I want one of these darling bookcases in the reading nook. I love that it also is good-looking enough to go in your living room or in a bedroom. Bookshelf Thank You Cards – What thank you card isn’t improved by adding some books? I love these pretty cards! Go to the Library Sweatshirt – After just reading Harry Potter & the Sorcerer’s Stone to Ella, I’m remembering all over again how much I love Hermione. Bookroo – We’ve had a subscription for the past few months and I love it. I’ve been so impressed by the books they pick (most which have been new to me! ), the beautiful wrapping paper, and just the fun of gorgeous new books showing up each month. In the board book version you get 3 books and in the picture book subscription you get 2. You can also get $10 off your subscription with the code JANSBRAD. Library Card Pouch – I love little zippered pouches for pencils, makeup and keeping my diaper bag organized. And this one is the cutest thing I’ve ever seen. Kid Headphones – We got these for the two older girls earlier this year so that they could listen to audiobooks in the car on road trips or use the splitter to both watch movies on the iPad without complaining that they can’t hear. I love that they don’t go too high so I don’t have to worry about them damaging their eardrums and I’m amazed how durable they are (I’ve been certain they were going to break multiple times when the girls have pulled them, stepped on them, or otherwise treated them poorly, and they’ve bounced back looking brand-new). Plus, the little cat ears are too cute. Creative Lettering Journal – If you like writing in books as you like reading them, this lettering journal, created by my friend Lisa from Handlettered Design, is perfect. And then you can come over and write my name in all my books for me with your gorgeous lettering. Jane Austen Literary Print – I love the bright colors and the quote. A perfect little addition to your bookshelf. Audible Subscription – Bart asks my parents for this about every other year, because it’s one of the few things he knows he’ll totally use and love. I’m a mega library audiobook user, but it’s so frustrating when the library doesn’t have the audiobook you want or the wait list is 500 people long (inevitably on 1 copy). Audible has, hands down, the best collection out there, plus reviews of both the book itself and the narrator, plus if you don’t like a book for any reason, you can exchange it for a different one, no questions asked. Perfect for the person who wants to read more or has a long commute or wants something to listen to while they exercise or fold laundry or lie on the bed listening to audiobooks (I would be behind door number three, in that example). Giving Tree MacBook Decal – The only downside is that you MAY want to burst into tears every time you see it. Pride & Prejudice Bracelet – These bracelets are so pretty and classy and there are tons of options for the wording on them. Library Due Date Phone Case – I love that even though most libraries don’t even HAVE due date cards in their books anymore, this is such an iconic look (I mean, there are due date scarves, for crying out loud). Any other gifts for book lovers I should know about? This Anne of Green Gables book scarf is so you! Love that little pouch! It actually is originally from the New York Public Library shop and they still have some in stock. Plus, you get the bonus of supporting a great library system! I have a book club and every December, we do a gift exchange. This year, I gave a book light because, as I told everyone, having a book light has dramatically improved the quality of my life! I can read as late as I want in whatever position and the light falls perfectly on the page (unlike the light from my bedside lamp). Some other popular gifts were adult coloring books and this gorgeous piece of wall art one girl made from pages of an old weathered book. It was amazing and I am still sad that gift got stolen from me!